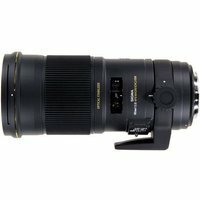 The Sigma APO Macro 180mm F2.8 EX APO DG OS HSM is a fast telephoto macro lens with a magnification ratio of 1:1 and a large maximum aperture of f2.8. Sigma's Optical Stabiliser (OS) function and the wide f2.8 aperture allows for faster shutter speeds and a narrow depth of field, enabling photographers to emphasize the subject. Three FLD (F Low Dispersion) glass elements provide excellent colour correction for colour aberrations and Super Multi-Layer Coating reduces flare and provides sharp images with lots of contrast. The rounded 9 blade diaphragm ensures an attractive blur for parts of the photo that are out of focus. At 1:1 magnification, this lens has a focusing distance of 47cm/18.5in which is a greater working distance than shorter focal length macro lenses.